This 3-star hotel is located right in the heart of Helsinki and is only a short distance away from the major attractions. Numerous shopping venues, museums, and theaters are located near the Hotel Cumulus Kaisaniemi Helsinki, and public transportation can be used in order to reach attractions outside of walking distance. There is an underground station located right next door to the Hotel Cumulus Kaisaniemi Helsinki and the bus station is just a short walk away. The main railway station can be found 300 meters from the hotel. 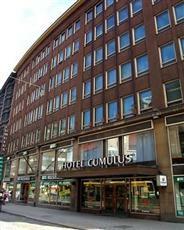 A number of comfortable guestrooms are available in the Hotel Cumulus Kaisaniemi Helsinki. Each room comes with a mini-bar and private bathroom. The Hotel Cumulus Kaisaniemi Helsinki was built in 1926 and was last renovated in 1999. Complimentary buffet-style breakfasts are available to guests each morning, and delicious meals can be enjoyed throughout the day in the restaurant. Guests looking to keep in touch with friends and family during their trip can make use of the property’s wireless Internet access.